Let’s face it, despite all the efforts of the marketing community to champion brand building, there are many businesses that don’t get – or simply pay lip service to – ‘brand’. Typically they see ‘branding’ as a name, logo, slogan or a few graphics that they slap onto what they sell. And typically these businesses see their products or services as highly rational offers; things that are bought for a straight-forward set of features that are very similar to those offered by competitors. While they may not use the term, essentially they think of their products as commodities. This unspoken belief then becomes self-fulfilling. Indistinct, unnoticed and unloved, their offers end up competing on price in a race to the bottom. What these businesses lack is an appreciation of ‘brand’ as a story or promise that can create a greater sense of value for their customers and/or push them apart from competitors. Without this appreciation they don’t put in the extra effort or imagination needed to decommoditise their offers. While there are many options in the brand building toolkit, products that sit at the more commoditised end of the spectrum usually need to work harder to find their points of difference. For those that face this challenge, here are three interesting examples that we’ve randomly spotted that may help get you thinking. Until recently there have been few products in the supermarket as commodotised as eggs. But now we have eggs that are Cage Free, Free Range, Barn Laid, RSPCA Approved and Certified Organic. Still, if you want to buy Cage Free eggs then one brand is as good as the next, right? Not according to Sunny Queen Farms, who have clearly dug deep to come up with a comprehensive set of proof points. Not only do their hens enjoy “natural light and fresh air” but they also get to lay their eggs in “cosy nesting boxes”. 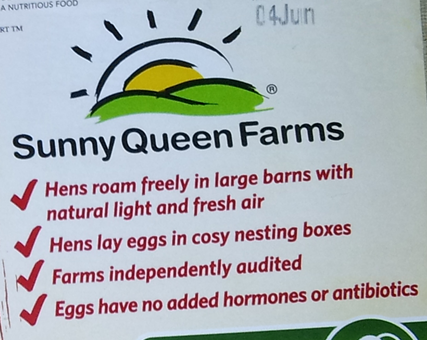 (And if these aren’t enough, Sunny Queen is also “Owned by Australian Farmers” and home to Sunny The Egg!). When was the last time you thought twice (or thought at all) about who cleans public toilets. It’s not rocket science, so most venue owners would choose a cleaning company on fairly black and white criteria – reliability and price. 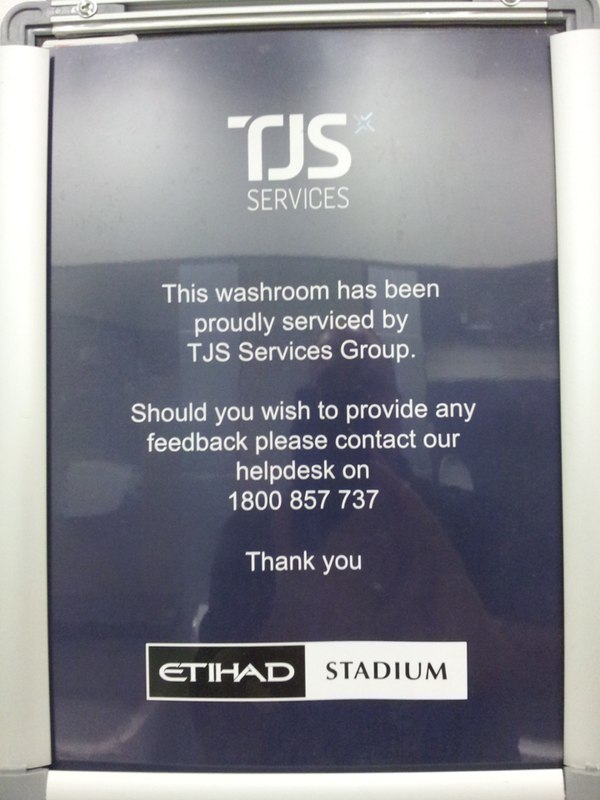 But as seen in this poster in the washrooms of Melbourne’s Etihad Stadium, there is a cleaning company that apparently takes more pride in the quality of its work than others. So much so that it’s willing to publically stand behind what it does and invite comment on it. It says a lot with a little about what the company’s brand values are. If you ran a venue you’d probably give TJS Services a call. Within any given faith there is an expectation that one place of worship will be much the same as another. Afterall, churches literally sing from the same hymn book. 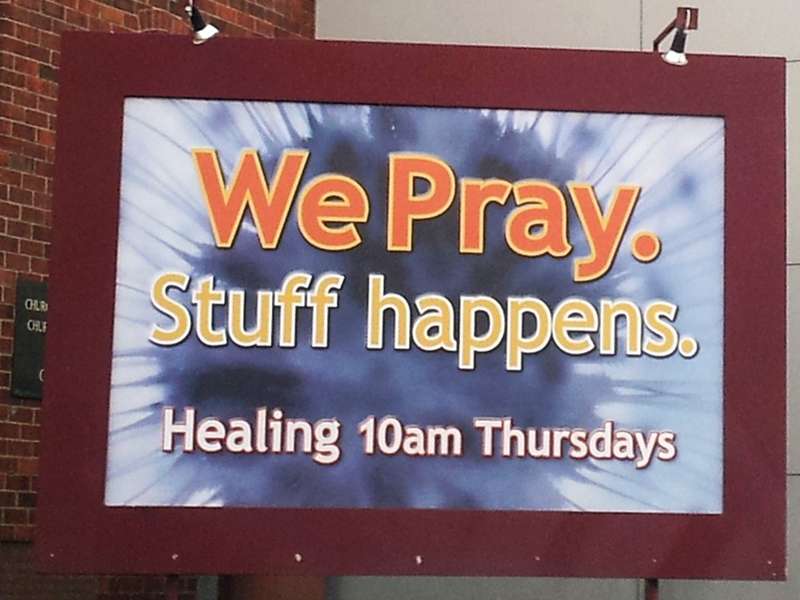 But what if a church offered a bit more of a light-hearted approach to it all? This billboard both makes you smile and wonder if this particular church indeed offers something different. As can be seen by these examples, if you think your offer is a commodity, then look again. It may take some digging and lateral thinking, but somewhere in your product or service there’s a story to be told that can help your brand work harder for your business. « P&G’s restructure – the ‘end of marketing’ or the beginning of ‘brand asset management’?